Say you work in an office that’s been using dBase for years to store its records – and now that installation of dBase is corrupted! How do you get into those DBF files? Have you lost decades of information? Not if you have today’s discount software promotion, CDBF - DBF Viewer and Editor! 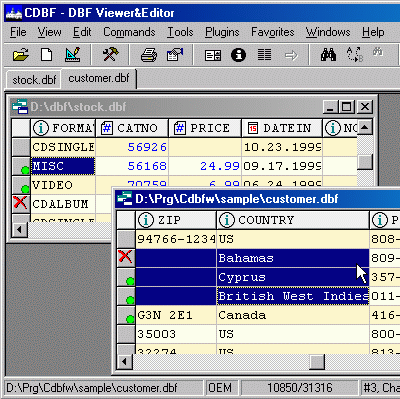 CDBF - DBF Viewer and Editor lets you access DBF files directly using the Windows interface, with no programming required. With CDBF - DBF Viewer and Editor, you’ll be able to benefit from an intuitive GUI that makes it easy to view and edit fields in dBase III, dBase IV, FoxPro, Visual FoxPro and dBase Level 7 files. What can you do with CDBF - DBF Viewer and Editor? How about viewing, editing, and repairing DBF database files, print database tables, and export data in DBF files in a variety of popular file formats? Throw in an integrated designer that lets you create professional-grade reports, and CDBF - DBF Viewer and Editor becomes an invaluable part of your database management arsenal! After you purchase CDBF - DBF Viewer and Editor it may be used indefinitely. CDBF - DBF Viewer and Editor is licensed per user, so if more people are going to use CDBF - DBF Viewer and Editor you will need to purchase additional copies.